Metroidvanias often pride themselves on the freedom of movement, giving their playable character space jumps or transformations in addition to a number of variations on their basic weaponry. Even titles like Salt and Sanctuary offer the ability to warp gravity, air dodge, and wall jump, despite being a blend of non-linear action platforming and punishing action role-playing games. Some games, however, are better not because they add more, but rather for what they take away. Unworthy strips away color and the ability to jump in order to offer something memorable. In doing so, the game stands alone as a punishing action role-playing title even when it has so much in common with Metroidvanias. Will it appeal to you, or is it unworthy of your attention? Read on and find out. 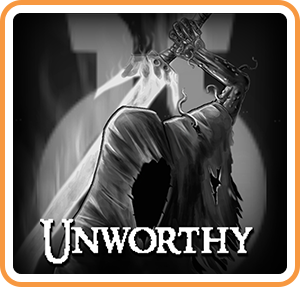 In a bit of an unfortunate marketing push, Unworthy is labeled as an action platformer without jumping, which sounds a bit dull. Make no mistake, however, this is a stamina-based action role-playing game with an emphasis on dodge-rolling and slow, methodical combat. The obvious comparisons are obvious, so I won’t even state it. Once more, it is what Unworthy does that is unique which makes it so impressive, so let’s focus on that. First, acquiring weapons in Unworthy is not a simple task. The first few weapons must be unlocked by winning boss encounters, but each of them adds to the player character’s moveset in order to complicate each engagement moving forward. You’ll start with a sword and shield, which only blocks attacks once if you’re not moving, this ability resetting after a cooldown period. The second weapon, however, is a massive hammer with attacks that cannot be stopped, which can be either helpful or harmful. This weapon also allows players the ability to manipulate the environment in specific ways and uncover secrets. Later on in the game, players will discover a bow and arrow that can teleport the bearer to where their arrow hits. These abilities are used to create clever environmental puzzles as well as thrilling boss battles. Make no mistake, one of Unworthy’s greatest strengths is how its bosses and enemy encounters demand multiple weapon types. Considering all weapons have fairly similar attack combinations, swapping between them for their individual, unique abilities is crucial in overcoming some devastating attack patterns. Want to dodge a slew of magic attacks? You might need to teleport around them, or use your hammer to create a barrier. As bosses grow in intensity, so does the complexity of what is required of the player in order to overcome them. While you can quick-toggle between two main pieces of weaponry, you can also rotate between all of your weapons with a quick click of the right stick. Exploration utilizing weaponry is essential, as well – the world is littered with runes that can be equipped to a character in order to further diversify a build. Runes can be hidden behind collapsing walls or hard to reach spaces, and although they can alter stats and abilities in useful ways, they almost always have a negative effect, as well. Attempting to maximize certain aspects of your play style may require specific rune combinations, so scouring the world is always a valid tactic. Unworthy’s currency and equipment systems are also unique, allowing for different approaches and increased risk and reward. The “souls” of this title are “sins,” and they will be lost entirely if a player should die on their expeditions throughout the game’s oppressive world. The game does have the decency to keep your dropped sins at the entrance of the room where you died, so getting them back is rarely an issue. 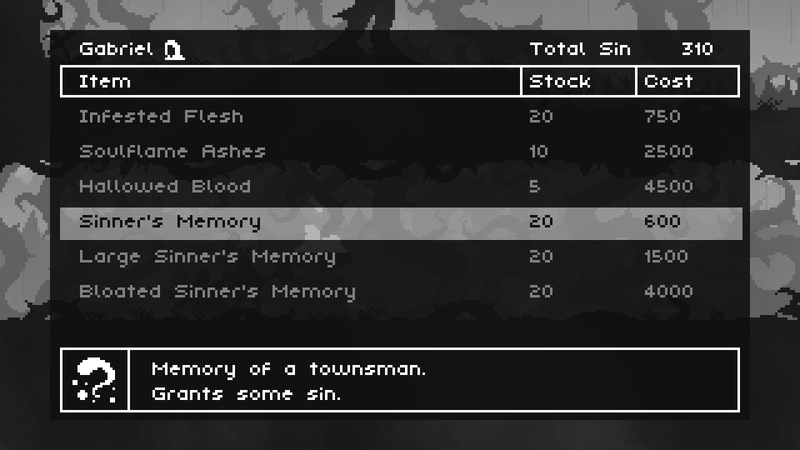 Sin can be spent on consumable items, or used to power more meaningful upgrades. Once receiving a brand for sin absolving at kilns, you can buff your character in ways that scale with your level – increasing defense or stamina depletion, for example. Maxing out these skills is not easy, however, as each requires a slain boss in order to access or stack. This not only creates an immaculate gameplay balance for a first playthrough, but also allows the game’s difficulty to scale extremely well during New Game+ runs. Keep in mind, this sin-spending system functions atop the basic level-up system, which functions as the player defeats enemies and steadily grows more powerful. As is the case with many ARPGs of this sort, lore is steadily filtered through across various dialogues and an oppressive atmosphere. The player character is somehow undead due to a seeming lack of purpose, which seems to conflict with the continuous theme of death being a great equalizer throughout the title. However, each literal death in the game flashes the title screen once more, which more or less means your purpose has not been fulfilled until you’ve beaten the game proper. Though not as extensive as, say, the hunter’s journal in Hollow Knight, a bit of flavor text is added into the in-game equipment menu’s grimoire after defeating an enemy type or acquiring a new item. Likewise, there’s still plenty of world building to be found throughout the game, and even more subtle details delivered through environmental design and backgrounds. 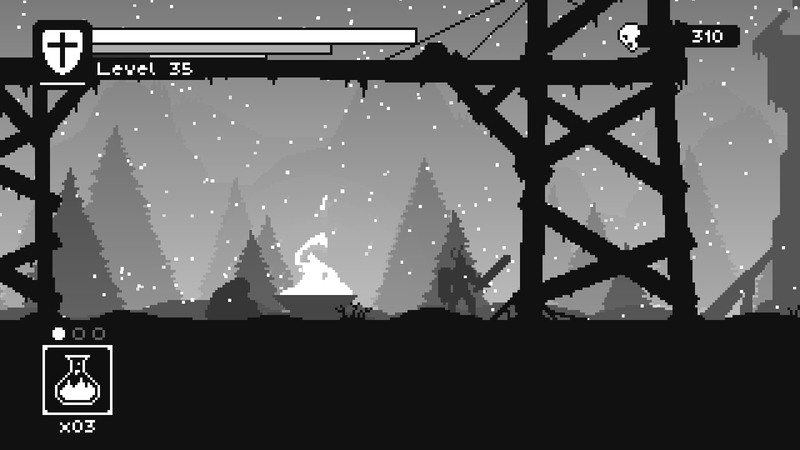 Although the idea of a monochrome platformer might sound bland, Unworthy is anything but. 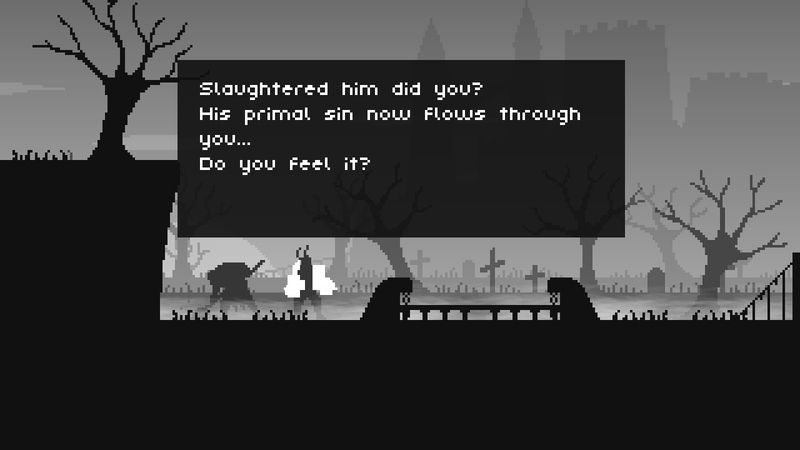 Enemies are all merely silhouettes, but their movement patterns and behavior are all clearly telegraphed. 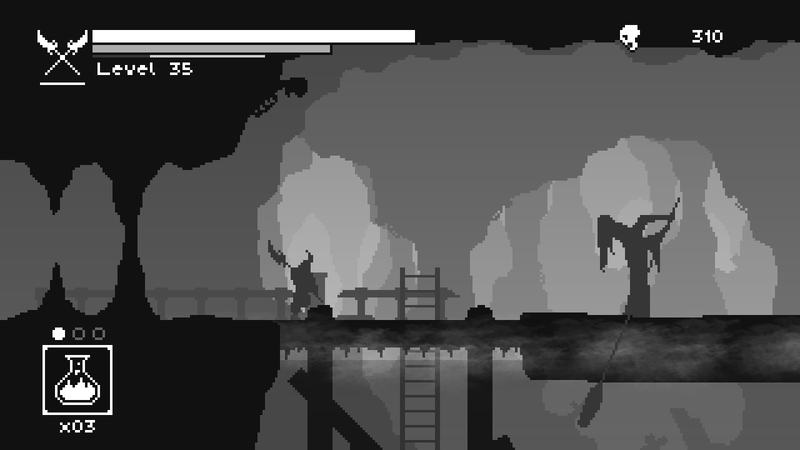 Black, white, various shades of gray, and splashes of crimson will be all you’ll see throughout your time with Unworthy, and it arguably enhances the level of oppression that the game’s enemies and environments communicate. Despite this monochrome landscape, the backgrounds are extremely detailed, giving each area a distinctive feel. It’s surprising just how much variety is present, here, but it further shows how strong art direction can make or break a game. Unworthy’s OST is gloomy and epic, somewhat par for the course with titles in its category, though the tracks are all well-fitting. The boss themes in particular are fabulous, catchy and empowering enough to stay enjoyable even after multiple boss runs. While I picked up Unworthy with the intention of solving its strange marketing push, I was pleasantly surprised to find not just a competent Souls-like RPG, but a fantastic one, at that. The way the game encourages exploration via its weapon use, the stark visual style, and the excellent enemy balance make for a wonderful and challenging experience. I feel that it is necessary to point out this title, as it equals titles like Salt and Sanctuary, Momodora, and Animus with ease, even surpassing them in some places. If you’re a fan of the genre, this game offers its own unique twists as well as all of the features that you love. Don’t sleep on this “action platformer without jumping,” because it’s an ARPG with so much more.